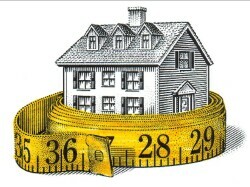 A question I get all the time from my clients is it a good idea to determine home value based price per square foot? I get this question from both buyers and sellers. I wish pricing a home in Santa Barbara or any home for that matter, was that easy. In real estate, as with many things in life, the easiest solution are not always the best or most accurate solution. Everyone, realtors, sellers and buyers alike would love a simple and concise way to determine the value of a home in a quick, simple and most important, accurately. You take the price of a home, divide it by the square footage and !!!WHAM!!! you have the value of a home. Easy-peezy – right!!?? Not so fast, there is far complicated than that when it comes to determining a homes value. What is the size of the lot? Inner city postage stamp or Hope Ranch acreage? The neighborhood and how it compares to the neighbors around it? Age of the home. Is it 1910 original or newer construction? If it is older, how old and has it been updated or remodeled and if so to what extent? General state of repair of the home. Is it well loved or is it worn and tired?